Longwall method of working consists in laying out long faces (60-200 m long) from which all coal in working section of the coal seam is removed by a series of operations, maintaining a continuous line of advance in one direction and leaving behind the void (called goaf). The roof over the goaf is partially or completely supported by walls of stone(called pack walls), sand or other material like crushed stone to prevent collapse of roof and only a small strip 3 to 6 m wide and parallel to the face is supported by timber or steel props, bars or chocks in a systematic manner. The extraction of coal commences from the vicinity of the shaft pillar and proceeds outward towards the boundary of the mine or panel. Approach to the face is by parallel roads, formed at a specified distance apart which is equal to length of the face. The roof over the goaf may be supported by packwalls or sand stowing or allowed to cave in. 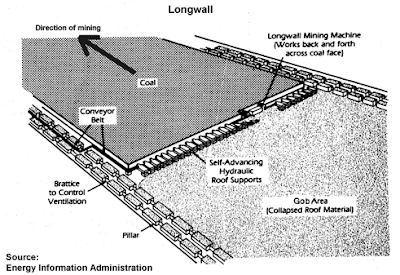 In this, the pairs of headings are driven in solid coal, certain interval apart, to a predete-rmined boundary where they are connected by a long roadway to provide a longwall face. Extraction of coal then commences from the boundary and the coal face retreats towards the shaft. In this system goaf packing is not essential for roof support if subsidence of surface or strata above the seam is permitted.